For other uses, see Trades Union Congress (disambiguation). The Trades Union Congress (TUC) is a national trade union centre, a federation of trade unions in England and Wales, representing the majority of trade unions. There are fifty-one affiliated unions with a total of about 5.8 million members. The TUC is the voice of Britain at work. The current General Secretary is Frances O'Grady. The TUC’s mission is to be a high-profile organisation that campaigns successfully for trade union aims and values, assists trade unions to increase membership and effectiveness, cuts out wasteful rivalry and promotes trade union solidarity. The TUC's decision-making body is the Annual Congress, which takes place in September. Between congresses decisions are made by the General Council, which meets every two months. An Executive Committee is elected by the Council from its members. Affiliated unions can send delegates to Congress, with the number of delegates they can send proportionate to their size. Each year Congress elects a President of the Trades Union Congress, who carries out the office for the remainder of the year and then presides over the following year's conference. The TUC is not affiliated to the Labour Party. At election time the TUC cannot endorse a particular party by name. However it can point to policies that it believes would be positive for workers’ rights, or to social cohesion and community welfare. It can also politically campaign against policies that it believes would be injurious to workers. The TUC also runs the Tolpuddle Martyrs Museum and annual Tolpuddle Martyrs' Festival and Rally commemorating the Tolpuddle Martyrs and their impact on trade unionism. The TUC Library preserves documents related to labour history in Britain and other lands. It was established in 1922 and now focuses on expanding the online and digital collections. The TUC archives are held at the Modern Records Centre at the University of Warwick Library. The archive contains files from c1920 - 1991 consisting of correspondence, internal and external documents, minutes, reports, printed material and press statements. The TUC campaigns on a wide range of issues relating to the experience of people at work. Notably, the TUC succeeded in forcing Sports Direct to undergo an independent review into their treatment of workers in September 2016. In October 2016, the TUC's campaign against the Trade Union Bill won 'Best Public Affairs Campaign' at the PR Week Awards. In 1948 the NHS was created as a result of union campaigning. In 1970 the Equal Pay Act made it illegal for employers to give a woman worker different pay and conditions to a male one doing work of equal value. In 1999 the National Minimum Wage was established to protect low-paid workers. In 1999 a limit was placed on working hours, largely as a health and safety measure. This was quickly followed by a minimum holiday entitlement. In 2007 the no-smoking ban was introduced in public areas in response to union arguments that workers were risking their health. In October 2011 agency workers gained the right to receive the same treatment as permanent staff carrying out the same work. The TUC was founded in the 1860s. The United Kingdom Alliance of Organised Trades, founded in Sheffield, Yorkshire, in 1866, was the immediate forerunner of the TUC, although efforts to expand local unions into regional or national organisations date back at least forty years earlier; in 1822, John Gast formed a "Committee of the Useful Classes", sometimes described as an early national trades council. The first TUC meeting was held in 1868 when the Manchester and Salford Trades Council convened the founding meeting in the Manchester Mechanics' Institute (on what is now Princess Street and was then David Street; the building is at no. 103). The fact that the TUC was formed by Northern Trades Councils was not coincidental. One of the issues which prompted this initiative was the perception that the London Trades Council (formed in 1860 and including, because of its location, many of the most prominent union leaders of the day) was taking a dominant role in speaking for the Trade Union Movement as a whole. The second TUC meeting took place in 1869 at the Oddfellows Hall, Temple Street, Birmingham where delegates discussed the eight-hour working day, election of working people to Parliament and the issue of free education. Arising out of the 1897 Congress, a decision was taken to form a more centralised trade union structure that would enable a more militant approach to be taken to fighting the employer and even achieving the socialist transformation of society. The result was the General Federation of Trade Unions which was formed in 1899. For some years it was unclear which body (the GFTU or the TUC) would emerge as the national trade union centre for the UK and for a while both were recognised as such by different fraternal organisations in other countries. However, it was soon agreed amongst the major unions that the TUC should take the leading role and that this would be the central body of the organised Labour Movement in the UK. The GFTU continued in existence and remains to this day as a federation of (smaller, often craft-based) trade unions providing common services and facilities to its members (especially education and training services). 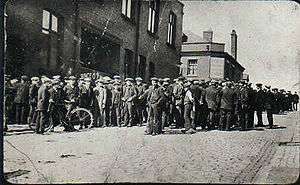 As the TUC expanded and formalised its role as the "General Staff of the Labour Movement" it incorporated the Trades Councils who had given birth to it, eventually becoming the body which authorised these local arms of the TUC to speak on behalf of the wider Trade Union Movement at local and County level. Also, as the TUC became increasingly bureaucratised, the Trades Councils (often led by militant and communist-influenced lay activists) found themselves being subject to political restrictions and purges (particularly during various anti-communist witch-hunts) and to having their role downplayed and marginalised. In some areas (especially in London and the South East) the Regional Councils of the TUC (dominated by paid officials of the unions) effectively took over the role of the County Associations of Trades Councils and these paid officials replaced elected lay-members as the spokespersons for the Trade Union Movement at County and Regional level. By the end of the 20th century local Trades Councils and County Associations of Trades Councils had become so ineffective and weak that many had simply faded into effective dissolution. The 1899 Congress saw a motion "calling for a special conference to establish a voice for working people within parliament. Within the year the conference had been held and the Labour Representation Committee established (the forerunner of the Labour Party)." The major TUC affiliated unions still make up the great bulk of the British Labour Party affiliated membership, but there is no formal/organisational link between the TUC and the party. The Scottish Trades Union Congress, which was formed in 1897, is a separate and autonomous organization. The Parliamentary Committee grew slowly, confining itself to legal matters, and ignored industrial disputes. In 1916 Harry Gosling proposed that organized labour needed an administrative machine. Following the railway strike of 1919, Ernest Bevin and G. D. H. Cole proposed a new system. The Parliamentary Committee became the General Council, representing thirty groups of workers. The General Secretary of the Trades Union Congress became chief permanent officer of the TUC, and a major figure in the British trade union movement.The system was successfully implemented by Fred Bramley and Walter Citrine. By 1927 the TUC had the making of a trade union bureaucracy similar to the civil service. During the First World War, the Trades Union Congress generally supported the aims of the British Empire. However, in 1915, national conference voted against the introduction of military conscription. The TUC played a major role in the General Strike of 1926, and became increasingly affiliated with the Labour Party in the 1930s, securing seven of the thirteen available seats on the newly created National Council of Labour in 1934. A TUC survey of local trades councils who were approached by unemployed marchers for support in 1936 shows widespread support for unemployed workers' protest marches among the local trade union activists. The TUC leadership subsequently tried to distort the result of the survey to justify its own opposition toward unauthorized marches. 1 2 "About the TUC". TUC. Retrieved 2016-10-10. ↑ "TUC: Frances O'Grady is first female leader". BBC News. ↑ Chris Coates, "Union History Online: Digitization Projects in the Trades Union Congress Library Collections." International Labor and Working-Class History 76.01 (2009): 54-59. ↑ "Trades Union Congress". mrc-catalogue.warwick.ac.uk. Retrieved 2016-10-10. ↑ Farrell, Sean (2016-09-24). "Sports Direct's surrender is just the start, says TUC". The Guardian. ISSN 0261-3077. Retrieved 2016-10-10. ↑ "PRWeek UK Awards Winners 2016: Public Affairs | PR Week". www.prweek.com. Retrieved 2016-10-19. 1 2 3 4 5 "Trade Unions at Work: What they are and what they do" (PDF). TUC. Retrieved 10 October 2016. ↑ "Agency Workers | workSMART". worksmart.org.uk. Retrieved 2016-10-10. ↑ "TUC - History Online". unionhistory.info. Retrieved 12 June 2012. ↑ "TUC - History Online". unionhistory.info. ↑ Matthias Reiss, "Circulars, Surveys and Support: Trades Councils and the Marches of 1936," Labour History Review (2008) 73#1 pp 89-112. Clegg, Hugh Armstrong. A History of British Trade Unions since 1889, vol. 2, 1911-1933 (Oxford University Press, 1985); A History of British Trade Unions since 1889, vol. 3, 1934-1951 (1994). Roberts, B C. The Trades Union Congress 1868-1921 (Harvard University Press, 1958). Wikimedia Commons has media related to Trades Union Congress.